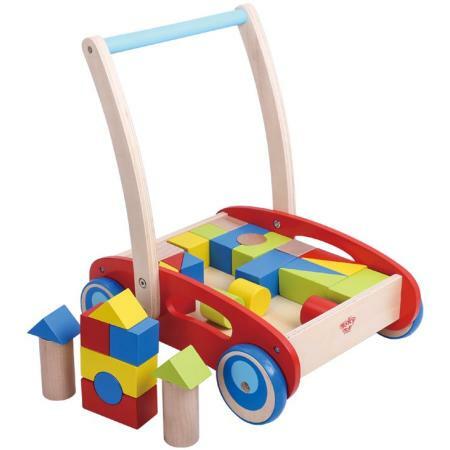 Wooden Baby Walker With Blocks is a beautifully made strong classic toy which comes with 33 colourful solid wooden blocks. This block walker has rubber tread on its wooden wheels so the walker can't slip sideways on a shiny surface and the handle is well placed on the tray to help avoid the walker tipping up. Hand holes are cut into the walkers tray making it easy for parents and older children to pick the whole thing up and move it. This is a truly multi-purpose toy from helping your little one learn to walk and balance to building and also a great puzzle when it comes to fitting the blocks back into the tray. Size: 34.5cm long x 28.5cm wide x 40cm high handle. Material: Wood with Child safe paint. Metal screws and hexagonal bolts. We like this because: "Simple and very well designed."